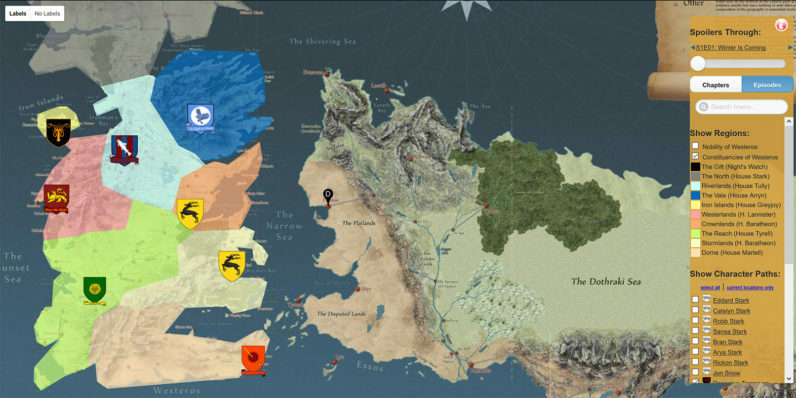 Thanks to Quartermaester, a new interactive map, I can brush up on various locations named in the series, learn which kingdoms belong to which houses and hopefully become less annoying to stream the show with. The map is incredibly detailed and includes both confirmed and speculative locations of cities, towns and castles from George RR Martin’s magical world. You can also click on icons depicting each of these to learn more over at the Game of Thrones wiki. Plus, you can follow the routes taken by key characters through the six seasons of the show or the various chapters of the book series. And depending on how far along you’ve got in either of them, you can filter out spoilers by adjusting the slider in the menu. If you’re still clueless about various aspects of the show, this is a handy guide for figuring things out while you rewatch the entire series before the next season arrives. We sometimes update and/or re-publish articles from our archives that are fun, informative, or timely… like this one.